Magnifies an elliptical region of the source to create a glass lens refraction effect. Magnify Amount: Default: 2, Range: any. Amount to scale the image within the magnified region. Use values below 1.0 to shrink the image instead within the lens. 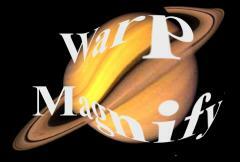 Magnify Rel: X & Y, Default: [1 1], Range: 0 or greater. The relative horizontal and vertical magnification. Lens Center: X & Y, Default: screen center. The center of the lens shape. This parameter can be adjusted using the Lens Center Widget. Lens Radius: Default: 0.6, Range: 0 or greater. Radius of the inner part of the lens. Within this region, the source is scaled by the full magnify amount. This parameter can be adjusted using the Lens Radius Widget. Lens Edge Width: Default: 0.2, Range: 0 or greater. The width of the lens edge, as a fraction of the inner radius. In the edge area of the lens, magnification tapers off from the full magnify amount to no magnification. This parameter can be adjusted using the Lens Radius Widget. Lens Rel Height: Default: 1, Range: 0.1 or greater. The relative vertical size of the lens. Increase for a taller ellipse, decrease for a wider one. Lens Rel Width: Default: 1, Range: 0.1 or greater. The relative horizontal size of the lens. Increase for a wider ellipse, decrease for a taller one. Lens Rotate: Default: 0, Range: any. Rotation in degrees of the lens. Note that rotation will have no effect when Rel Width and Rel Height are equal and the shape is a perfect circle. This parameter can be adjusted using the Lens Rotate Widget. Lens Edge Shape: Default: 0.5, Range: any. Determines the curve of the magnification amount within the edge of the lens. If set to zero, magnification tapers off linearly. If set to one, magnification tapers off in a smoother curve, which can reduce the visual perception of the border of the lens. Other values interpolate between the two.